Brandon, the second largest city and service centre in Manitoba behind Winnipeg, is a major hub for the surrounding agricultural area, with a trading area population sometimes estimated between 70,000 and 100,000 people. Brandon started as a major junction on the Canadian Pacific Railway, and the Assiniboine River and was then incorporated in 1882. Brandon's industry reflects its agricultural history; it's major industries are related to agriculture and include fertilizer and hog processing plants, as well as retail and government services for the surrounding area of Westman. Brandon is a prairie city with a very diverse culture. Each year Brandon shows off its multi-cultural by hosting the Lieutenant Governors Winter Festival at the beginning of February. There are over 14 pavilions that offer food and beverages from each culture. Home to Brandon Tourism, Brandon First and Ducks Unlimited Canada Provincial Field offices, the Riverbank Discovery Centre is located in the heart of the Assiniboine River Corridor. The tourism centre is open year-round, and contains information on the City of Brandon, all Canadian provinces and the United States. The centre also offers souvenirs, RV parking and dump site, picnic areas and interpretive information on the natural beauty of the area. For more information call 204-729-2141 or 1-888-799-1111. Brandon University is Manitoba's third largest university. 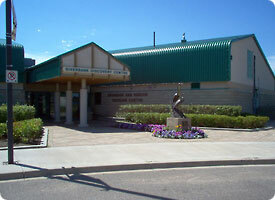 Brandon is also home to Assiniboine Community College.